This product review is a little different from the other product reviews I’ve done which are usually about one product or one event. I decided to do a little comparison between the adult dental flossers and children’s dental flossers. From a very young age, I’ve been cleaning my child’s teeth, first with that little silicone slip-on finger tooth brush followed by the many different child size toothbrushes. As she got older, I started using children’s dental flossers to reach those ‘hard to reach’ places where you KNOW plaque is building up despite my best attempts to get of them. Now, I usually only buy the children’s dental flossers when they’re on sale and my supply was starting to deplete and there was no sale in sight so I decided to pick up a pack of adult dental flossers after I carefully looked them over. 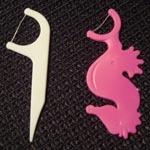 The photo on the left shows the two different flossers I’ve used, the pink seahorse is obviously the children’s dental flosser and the plain white one, well that’s the adult flosser (I guess adults don’t deserve cutesy shapes). 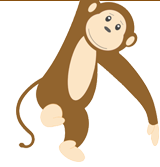 Product review and comparison: What happened? First off, there is a significant difference in price. On sale, my children’s dental flossers were under a dollar a pack of 30. At full price though, they were just shy of $3.00 if not more depending on the brands I saw. The adult flossers for a pack of 90 were under $3.00. Of course, prices vary depending on where you live but it makes sense that you’d get charged more for the cutesy children’s dental flossers than the plain old generic adult flossers. Another obvious difference: the colours and shapes. The pink seahorse is only one of three designs within my pack of 30 while the adult pack is just purely all white, all 90 of them. Adult Dental Flosser vs. Children’s Dental Flosser: who reigns supreme? Now, let’s talk about which one was more effective. I have to be honest with you and tell you that I was initially apprehensive about using the adult dental flossers on my wee kid’s mouth since there is a noticeable difference in size between the two flossers shown. However, I found the adult flosser REALLY REALLY easy to use and much more effective. The adult dental flosser is more streamlined which allowed me to angle it to remove plaque buildup especially in the back molars. The pointy tip is also functional (not for stabbing, thank you! Bathroom safety is key) but for me to scrap off unwanted bits of food or pick my kid’s teeth if I need to. It reminds me of one of those dentist tools (I know you know what I’m referring to!). With the children’s dental flossers, I found the shapes to actually get in my way. It’s harder for me to maneuver the sea horse shape complete with frills the way I need to to remove plaque because I end up jabbing my kid in the mouth which is NOT a good mommy thing to do. Now, I hold nothing against the company that made these children dental flossers because I have used them for the past 2 years but really, there needs to be more thought put into these things. What do I plan on doing in the future? I am definitely going to stick with these adult dental flossers that I found. Really truly, the just work better at removing the plaque and stuck on food from my kid’s teeth. Now, I’m not saying all adult dental flossers are supreme to their kid size cutesy counterparts because I’m sure there are some equally awesome kiddy dental flossers that I just haven’t stumbled across yet and there are probably some equally poor adult dental flossers. What I am saying though is that as a parent of a cute kid, your options may be more than you first thought and at a fraction of the cost! There is obviously a bundle to know about this. I feel you made some good points in features also. Could you update me with your next post please? Metropolis of Melbourne 67% (one,020 of 1,520) Thought th is was Way Cool .. yep, Thanks alot for th is superb write-up.